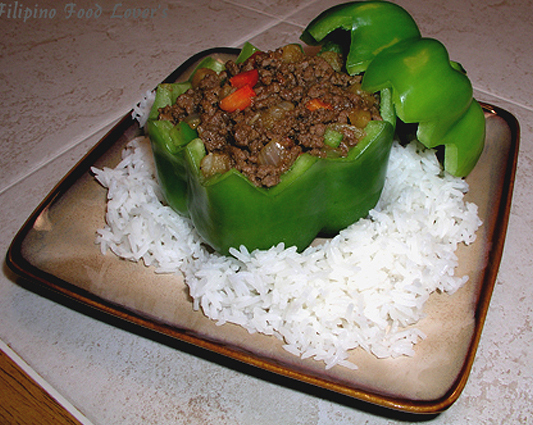 Picadillo consists mainly of ground beef. Picadillo is mostly seen and served at countries like Cuba, Mexico, and other Latin American countries. Picadillo comes from the Spanish word, “picar” which means “to mince” or “to chop”. Picadillo here in the Philippines (Filipino Picadillo) is made with beef and either potatoes or chayote (with other vegetables). 1). Heat oil in a casserole or large saucepan and saute onion until transparent, 1 to 2 minutes. 2). Add garlic and saute until fragrant. 3). Stir in minced beef and cook until brown. 4). Pour in beef stock or water and bring to the boil then simmer over medium heat. 5). Add diced potatoes and carrots and simmer until potatoes and carrots are tender, about 10 minutes. 6). Stir in spinach leaves if desired and heat through. Season it with patis, salt and pepper. Enjoy. Ang dami ko nang i-try lutuin ngayong bakasyon. Ito, parang napakadali tingnan. Kaya ko kaya to? For a nice variation, cook the same as above, but mix in an equal amount of steamed rice and one or two raw beaten eggs. Then spoon into bell peppers with the stem ends removed. Cook in 350 or 400 degree F oven for 20 to 30 minutes or until all the egg is cooked and the bell peppers are cooked. Delicious served in the bell peppers, and can be topped with a brown gravy or served with spicy peppers or a condiment like ketchup.